The Woodlands Grave Gardeners were featured on CBS Sunday Morning on Sunday, April 22nd. Watch the full Grave Gardener segment, titled “How Does Your Garden Grow?” above. The Grave Gardeners is a volunteer gardening program run by The Woodlands. Individual gardeners adopt a cradle grave, which they plant with Victorian-era plants and care for throughout the gardening season. As a site with many layers—The Woodlands was once the 18th century estate of amateur botanist and plant collector William Hamilton and was converted into a rural cemetery in 1840—we are always looking for interesting ways to engage visitors with the rich history of the site. Re-planting our Victorian cradle graves is the perfect way to beautify the space and share a unique aspect of The Woodlands history. Cradle Graves were popular in the Victorian era. Most would have been planted and maintained by the family of the deceased, but over the last several decades they have come to sit flowerless. When The Woodlands was established in 1840, it was very common for people to maintain little gardens in their family cemetery plots and to spend time there on the weekends enjoying peaceful green space outside of the city. 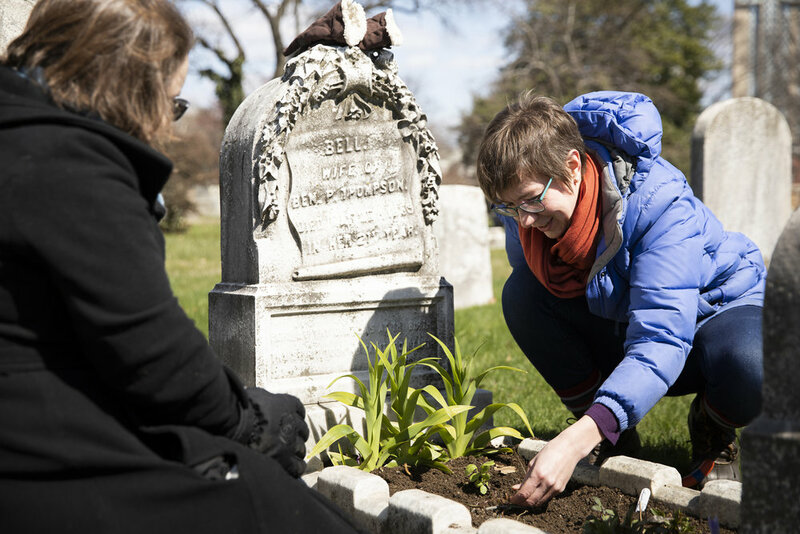 The Woodlands Grave Gardeners are reintroducing this practice by pairing volunteer gardeners with flowerless graves. what Types of plants are found in grave gardens? Gardening in cradle graves is essentially container gardening. Our planting list includes varietals that are well suited to grave gardening in terms of size and growth habit and would have been common in the Philadelphia area in the latter half of the 19th century. Our ever-growing plant list is informed by historical sources, including plant lists and catalogs from nearby sites and nurseries active in the botanical scene in the 18th and 19th centuries. How do you become a Grave Gardener?